Why isn’t Pelosi facing any Democratic challengers for speaker? Just hours after results started rolling in on Election Day, Democrats started to oppose Minority Leader Nancy Pelosi’s return as speaker. At the time, the anti-Pelosi faction was buoyed by victories by scores of candidates who had said on the campaign trail they would not support Pelosi as the party’s leader in the House. Dethroning the longtime House Democratic leader seemed like a real possibility. Since then, Pelosi, who served as speaker from 2007 to 2011, has shored up support from members-elect who had previously called for new leadership. At a House Democratic caucus meeting Wednesday, Pelosi ran unopposed and won the party’s speaker nomination by a 203-32 vote. Rep. Steny Hoyer of Maryland won the nomination for majority leader, and Rep. Jim Clyburn of South Carolina was picked as majority whip. Pelosi has shored up support from members-elect who had previously called for new leadership. Pelosi will need 218 votes in the binding speaker vote on the House floor Jan. 3., meaning she can afford to lose 17 votes if every Republican votes against her, as expected. Sixteen members and members-elect have signed a letter promising they will not support Pelosi, but already one has backtracked and others said before the Wednesday vote that they would support Pelosi only if there is no one else running. Why did so many Democratic candidates oppose Pelosi? On the campaign trail, dozens of Democrats in red districts promised that if elected they would not vote for Pelosi for speaker. In recent years a growing number of Democrats have pushed behind the scenes for a younger, more diverse House leadership team. The stance helped Rep. Conor Lamb, D-Pa., win a seat in western Pennsylvania in a March special election, and many candidates in tough races, from coastal South Carolina to Orange County, California, adopted his tactic. The opposition underscored Pelosi’s longtime dominance in Democratic Party politics and status as one of the country’s most targeted and divisive political figures. 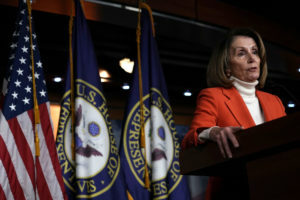 Ever since Pelosi became the first female speaker of the House in 2007, she has been vilified by Republicans as a liberal San Francisco lawmaker, while always facing some internal opposition from House Democrats as well. Pelosi became a face of the Affordable Care Act she helped pass through Congress, and in 2010 Democrats lost a historic number of seats in the House. Many of the Democrats who lost blamed Pelosi. Pelosi’s prominence has long made her a target of Republican attack ads. From January to June of this year alone, Pelosi was portrayed unfavorably in over 19,000 television ads, according to the Wesleyan Media Project, which tracks political advertising. But while the GOP’s anti-Pelosi strategy worked in past cycles, in 2018 the ads appeared to have been less effective. Democrats flipped 40 seats, more than enough to win control of the House. Pelosi and her supporters think that winning back the House — and the fact that she has no clear successor — should be enough to pave her path back to the speaker’s office. “She’s battle tested and no one else has demonstrated that they can do what she can do,” Democratic strategist Doug Thornell said. “That’s one reason why you haven’t seen anyone emerge” to challenge her, he added. So, who else is running? 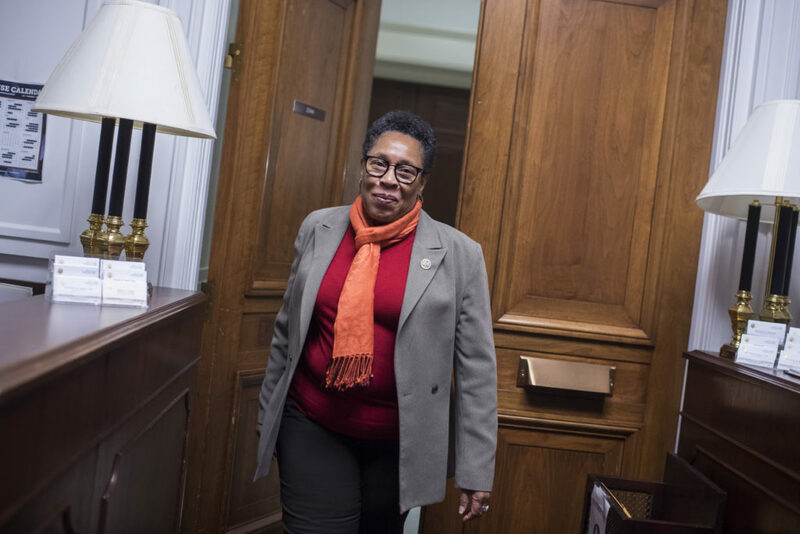 Reps. Seth Moulton, D-Mass., and Tim Ryan, D-Ohio — two of the key members who organized the anti-Pelosi letter — urged Rep. Marcia Fudge, D-Ohio, to launch a bid for speaker. But Pelosi offered Fudge, a former chairwoman of the powerful Congressional Black Caucus and a Pelosi skeptic, a top spot on an elections subcommittee in exchange for backing down from mounting a challenge. Why can’t Democrats find anyone else to run? There are two main reasons why no other Democrat is running for speaker. The first reason has to do with Pelosi’s power, and Fudge’s flirtation with running for speaker is an example. Pelosi has the political capital in her caucus to persuade members against challenging her, in part by offering perks like chairing a key subcommittee. Pelosi also has a long history of opposing Democrats who threaten her leadership. “I think she’s provided opportunities for people to put themselves in a position to eventually be her successor. But in the end, it’s up to them to build an operation and go for it,” Thornell said. Meanwhile, anti-Pelosi members like Ryan and Moulton are struggling to keep their coalition together without a viable leader to put forward as an alternative. Given that, some members-elect who opposed Pelosi on the campaign trail are now not as adamant for change.